This past weekend, friends and I (mostly) enjoyed a walking food tour of Walker’s Point (sometimes AKA “The Fifth Ward”), an up and coming neighborhood in Milwaukee. 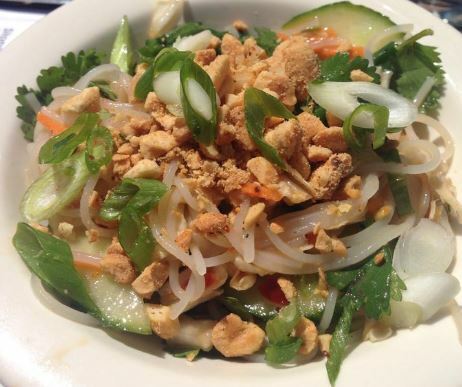 I learned about the food crawl through social media – shocking, I know! My friend’s plans changed, so as Stairwell Guy says, I turned to “Plan B”. He’s very good company, and not really a “Plan B”, but I did originally buy the ticket for a visitor, so I guess he is partially correct there. I thank him for being an enthusiastic and fun fill-in. Several weeks earlier, I had also invited my friend Phi and her husband to join us, which they happily did! 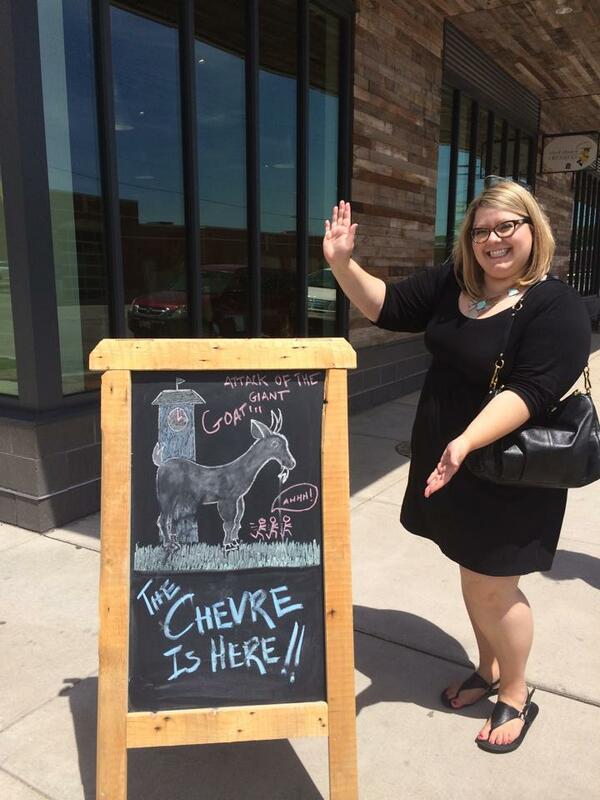 We met at the Blue Jacket on National Avenue, which served both as the kick-off point as well as host to Bloody Marys. 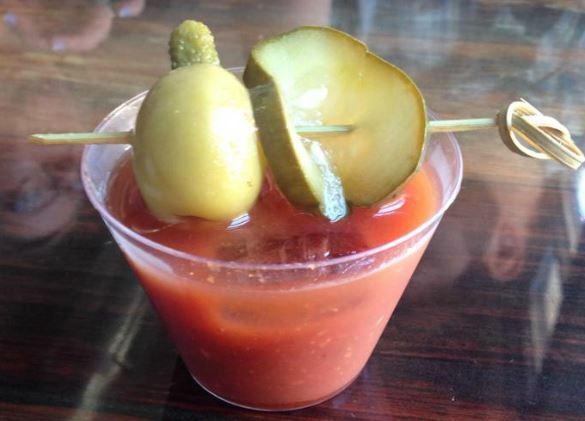 I was especially happy to be there to see Phi experience her first Bloody Mary – EVER! First sip…good stuff, then…the tomato kicked in a little too far for dear Phi. In my opinion, the Bloodys were a bit heavy on the seasoning, but were tasty enough (disclaimer: I don’t typically drink liquor drinks, so I am NOT an authority). Bloody Mary at The Blue Jacket. From The Blue Jacket, we headed on to Chez Jacques for crepes. From the almost hour-long wait we had, I have to assume that we were not alone with the plan to start with breakfast. This was both a frustrating, and surprising start to the #MKEFoodCrawl. Note: Throughout the day I spoke with folks on the food crawl, and to a T, every person expected a casual walk through Walker’s Point with tents or tables stocked with small plates for us to try, converse, and then move on. Instead, we were seated at each restaurant and served the small plates – sometimes in a timely manner, and often not. Chez Jacques staff addressed every table in the room before they even greeted our four-top, and we were the second group in the room. It was so frustrating that we were just getting ready to leave when someone asked us if we had been attended to. So, we placed orders and waited, and waited, and waited. When we finally were served our crepes (four choices, folks…shouldn’t the kitchen be prepared for that? ), three of the four were met with positive reviews. The chicken curry, the spinach Roquefort, and the vanilla berries crepes hit the spot. The banana Nutella (read: Hershey’s syrup) was, sadly, a bust. The dense filling of spinach and cheese along with the pine nuts were a delicious combination. It’s just too bad the restaurant seemed more than ill-prepared to deal with the #MKEFoodCrawl crowd. But, we were on to our next stop (finally!) by noon. We tried to visit Circa 1880, but the line was out the door and starting to wrap around the corner! So, we went on to Braise. 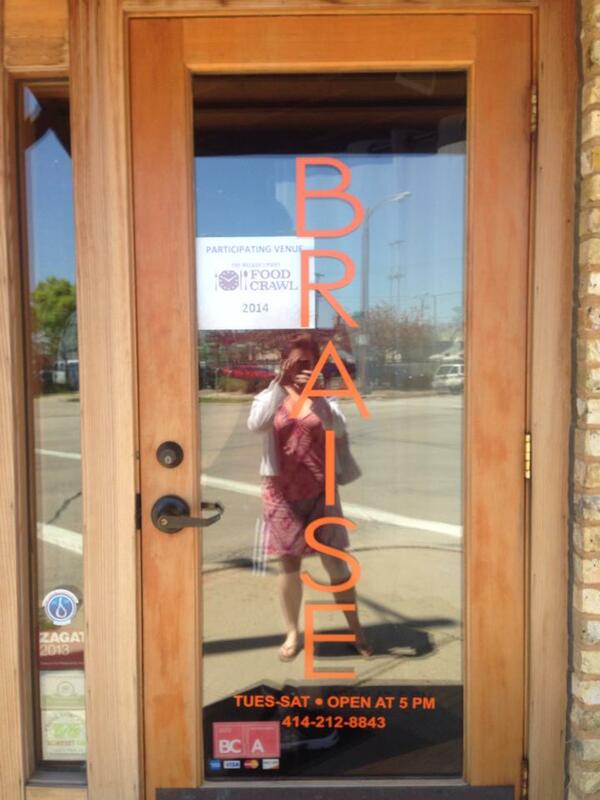 I have written about Braise before (my first meeting with Phi! ), and although Stairwell Guy was a newbie, we were all looking forward to checking out the yellow curry dal with ramp yogurt and the Grilled chorizo sope with ramp chimichurri & garlic chive crema. We were in and out of Braise in 20 minutes, and we had really exceptional dishes in that time. There were two servings of the curry, and two of the chorizo…both dishes were met with rave reviews. Phi and I also viewed the rooftop garden and dining area in the time we waited for our meals. Very efficient! 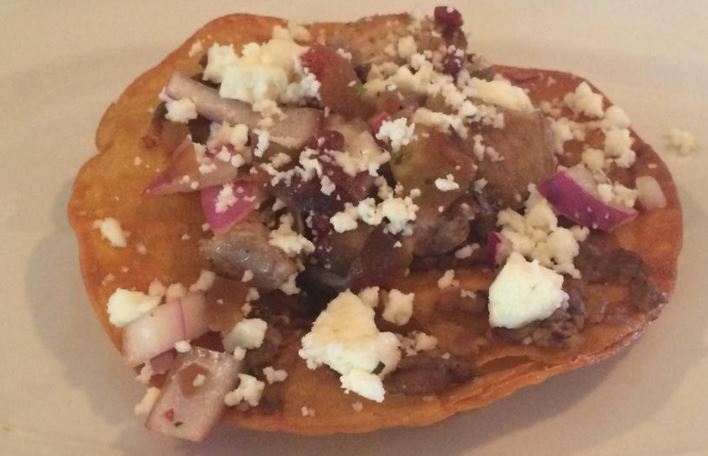 Then, onto Wayward Kitchen for Pork Belly Tostada with Watermelon Rind Salsa, Queso Fresco, and Refried Black Eyed Peas w/ Jalapeno. I liked the casual atmosphere of this “off the beaten path” place. Again, by all accounts, service was not expedient, but the experience was a good one. I struggled with my tostado because of its brittle nature – or because of user error! Nobody else seemed to struggle like I did. So, I’ll take the blame on that one! The Wayward Kitchen is also where I met up with a friend of the friend who left town early. We had met up with Jon Thursday evening, so it was nice to see him and meet his friends out in a different part of town! This is the friendly Midwest after all! We then headed up to Clock Shadow Creamery for pretzels and cheese. Well, cheese. The first thing we heard when we walked in the door is that Clock Shadow had just run out of pretzels. Since I’m not a fan of cheese curds (aka: squeakies), I opted to try the Basket Ricotta with lemon jam from The National Café and Take-away – another local fave! The Ricotta was quite tasty and the jam was a perfectly sour complement, but it was simply too much for any of us to finish. We were a bit bummed about not trying the pretzels, because they looked really good! From Clock Shadow, we headed toward Ginger, with a quick stop to check out a restaurant that will be opening very soon, Morel. It was cool to see the space in its final stages of construction and to meet the owner, sous chef and general manager. 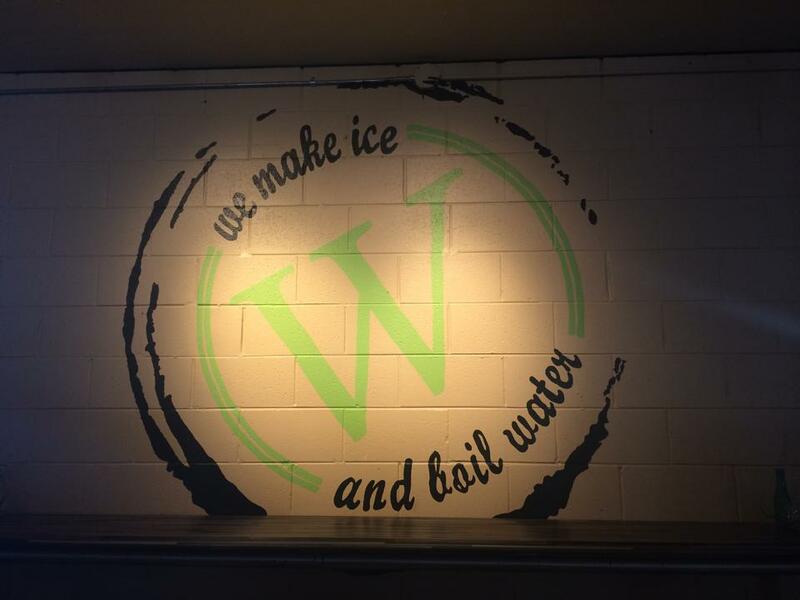 A very friendly bunch, and very excited to be opening a new space in Walker’s Point! Once we got to Ginger, we finally sat outside and enjoyed the beautiful weather of the day. Ginger has a lovely back patio. Again, the service was a bit slow, and our server forget to bring three of the plates we ordered. 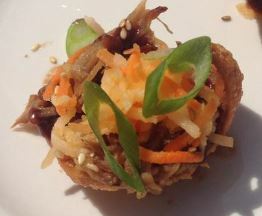 She apologized, quickly brought the remainder and comped the glass of wine I enjoyed with my Vietnamese Rice Noodles (chilled napa cabbage, carrot, peanuts and cilantro, soy chili dressing) and Hoison Braised Pork Shoulder on wonton chi (served with ginger carrot jicama slaw). Everyone else tried the Passion Fruit Ceviche: scallops and shrimp in a passion fruit citrus base with plantain chips and sweet potato and enjoyed the dishes as well. By this time, it was 2:45PM and the food crawl was to end at 3PM. We had only managed to visit half of the restaurants on the tour, and we had several tickets left. Phi and Nick needed to head home, so Stairwell Guy and I planned a quick stop at Zak’s Café for the stuffed French Toast he had been craving. He was not disappointed, although he was served the wrong dish – are you seeing a trend here with respect to the service that day? 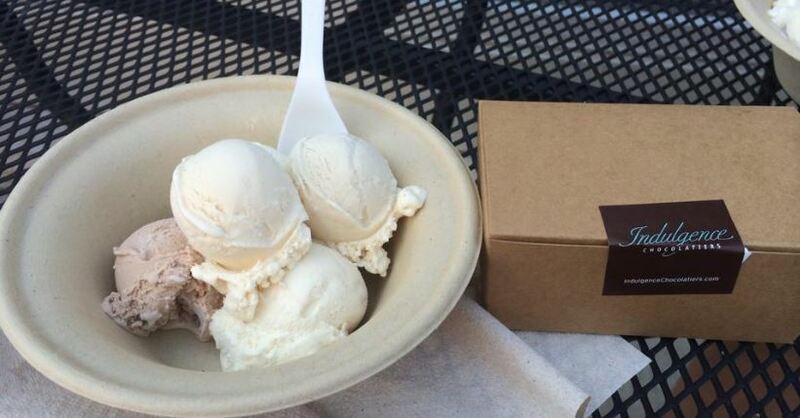 We hustled down the street with mere moments to spare in an attempt to finish with dessert. 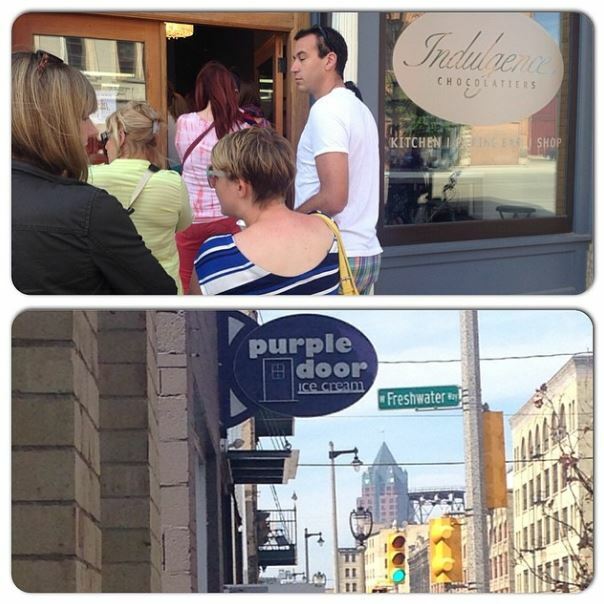 Jeff and I decided to divide and conquer, with him standing in the long line at Purple Door for ice cream (his favorite!) and me waiting in an equally long line at Indulgence Chocolatier (featured here). It was past 3PM at this point, but the local businesses were not going to turn away participants. We were able to hit the two spots at which we had planned all day to finish! Score! I have to give Stairwell Guy props – he knew my only criteria was “no maple!”, and he chose really well. He ordered me mini scoops of: Lime sorbet, chocolate cinnamon, Bailey’s Irish Cream, chocolate banana and butter pecan. A delicious sampling! 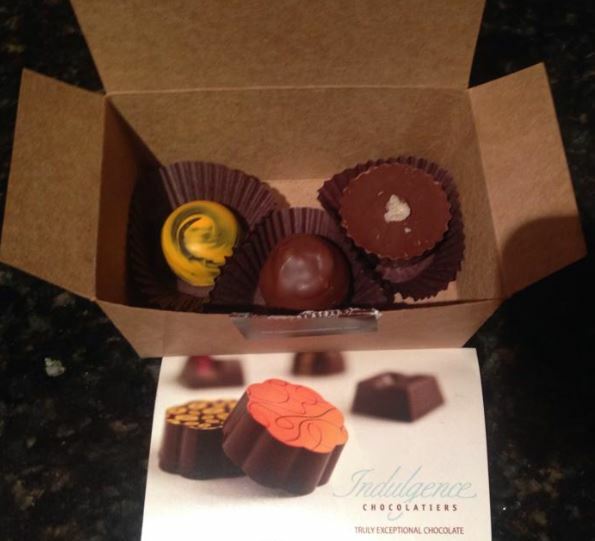 For him, I ordered orange cardamom, Thai peanut butter and milk chocolate truffles. He ate them on the way home, and told me just how much he enjoyed them. So, while the #MKEFoodCrawl was not exactly what we thought it would be, and the service in many venues did not seem prepared for our crowd, we really did enjoy the food, uncovering new restaurants and, of course, a lovely day with friends! One final note: Next year, I will not order the “gold” ticket package for 12 tickets, because the schedule just does not allow for sampling at enough venues to make it worth the $75. The “silver” package at $50 for seven small plates is absolutely sufficient. 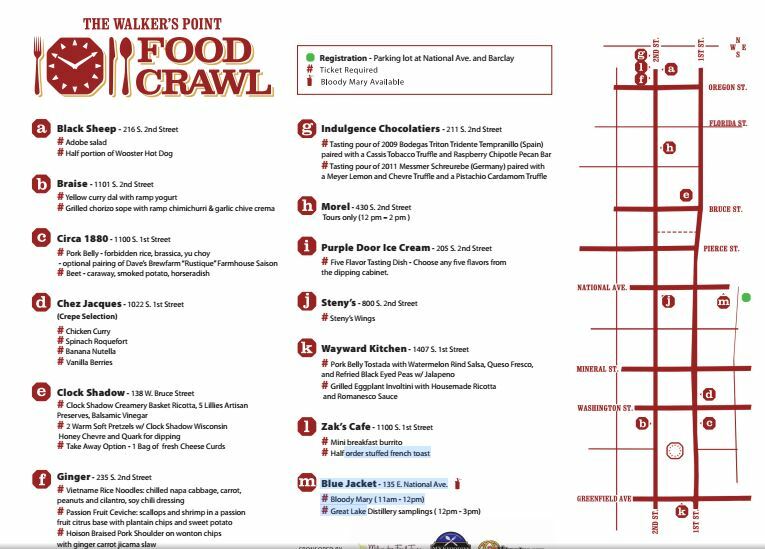 I’d love to hear comments from others on the #MKEFoodCrawl tour of Walker’s Point, as well as those of you who live in other cities and have participated in local food crawls. Please leave a comment below!